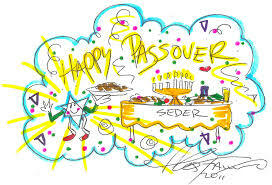 Passover doesn’t actually begin until the evening of April 3rd, but that date doesn’t work for me or my family. Between the NY Auto Show and other obligations, the Hebrew calendar couldn’t have chosen a more inconvenient time to start the 8-day celebration. This happens almost every year so we’ve taken it upon ourselves to time-shift a bit. That’s why we conducted our first seder tonight and will be wrapping up the holiday just after my fellow Members of the Tribe are into their first full day of matzoh-induced digestive difficulties. How do we get away with putting convenience over the religious calendar? No problem. Look up blasphemy in the dictionary and you may see a picture of my family. I’m the Jew, my Episcopalian wife makes the “to die for” matzoh balls and farfel, my daughter and her boyfriend pretty much believe in the power of online gaming, my son is not religious but warms to the matzoh ball soup, and we all love the tradition of getting together and re-telling the story of Passover. It’s a pretty exciting tale once you get into it and the plagues alone would make for an awesome video game. The question comes up, of course, whether it matters at all which eight days we choose to observe Passover. To some extent it does, but honestly, we figure if you keep it in the chronological vicinity of the rabbinically-endorsed date you’re in the ballpark. Think about it. Was Jesus really born on December 25th, or was the date chosen to coincide with college football bowl games? Indeed, the United Church of God website posits Jesus could have been born as early as November 18th which would put his birth even before Black Friday, confusing shoppers as to why the big sales started AFTER Christmas. We embrace the unorthodox way we celebrate both Jewish and Christian holidays because no matter what date we choose to observe them, we respect their meaning, customs and traditions. I’m pretty sure whoever is running the show from Heaven or a timeshare in Palm Beach He or She is getting a kick out of the whole thing and figures when it’s our turn to enter the Great Beyond, we’ll shake things up a little bit. Maybe even screw around with Yom Kippur and pass the word it’s now OK to eat and drink all you want…then you’ll have something to atone for.